How much should a 15 month old german shepherd be eating? My german shepherd is 15 months old and weighs about 30kg. She is very skinny and her ribs stick out but she eats a lot. What should she be eating? 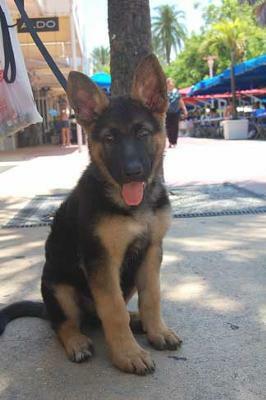 Total German Shepherd: German Shepherds tend to look skinny as they age throughout the puppy stage - I have a friend who calls this stage "the uglies". First, have your vet check your German Shepherd to make sure that there are no hidden issues of any kind and that your dog is healthy (or not) - then address those issues. German Shepherds aren't completely mature and considered adults until they're about 2 or older for females and around 3 or so for males. At that time normally the dogs will start filling out to their adult body shape and have a very nice "typical" GSD look. Since I don't know your dog and what you situation is I will tell you that I'd recommend that you feed your German Shepherd the best food that you can, supplement it with raw food and bones from time to time and to feed your dog across several meals each day instead of all at one time. And if you still feel your German Shepherd is thin try adding an extra small meal once a day and see how that works. But do it slowly and keep an eye on the results. Make sure you're watching the input and the "output" for any changes that might take place. But just make sure that you don't take your German Shepherd from thin to too heavy. It's much easier on the dog to keep it on the thin side as opposed to all the health issues that come from having a dog that is too heavy - arthritis, diabetes, hip issues, joint issues, etc., etc. Good luck!